2 7/9" x 1 5/8" x 3/4"
A master metalsmith in every respect, Linda MacNeil graduated from Rhode Island School of Design in 1976. MacNeil focuses on jewelry which allows her to create wearable sculpture and explore forms with great freedom. Her works are inspired by nature, geometry, architecture and MacNeil’s response to the quality of materials used, namely precious metals, mirrored glass and Vitrolite glass. With great skill and technical precision, Linda MacNeil masterfully creates jewelry from glass and metal that echoes various periods of historical design. Inspired by an interest in mechanical and architectural structures, MacNeil uses the traditional forms of the necklace, pendant and brooch as her art form. Lucent Lines is an ongoing series of polished and faceted glass jewelry. The geometric rhythms of the square, stepped form and chevron patterns, as well as the bold colors of this collection reflect MacNeil’s interest in Art Deco design. The most recent pieces in this series are brooches which are etched using computer-generated stencils. 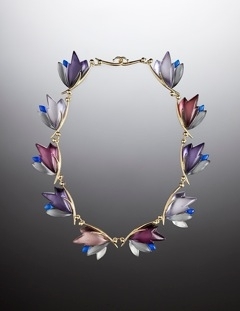 The Floral Necklace series is inspired by the jewelry of René Lalique. 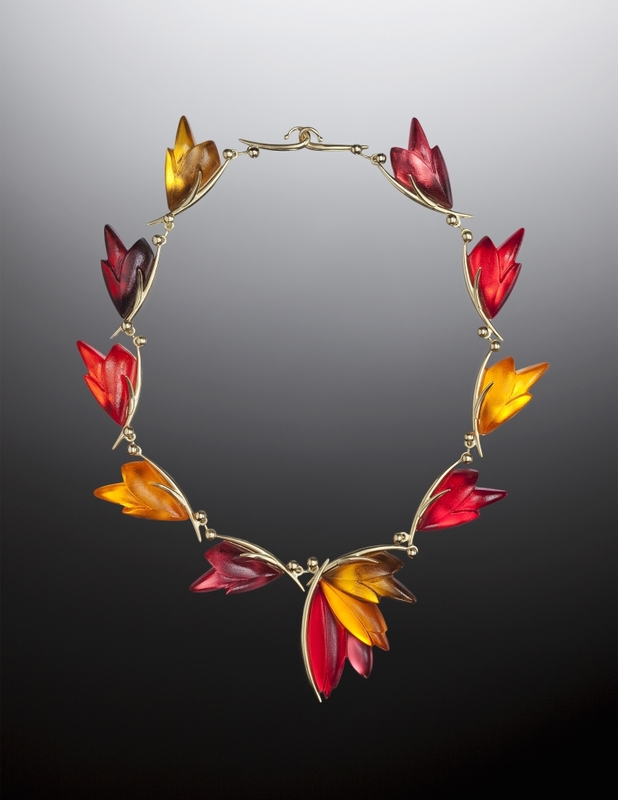 MacNeil states that “a pod or a flower in full bloom is an irresistible beginning for a jewelry design.” The beautiful organic flower forms of this series curve around the wearer’s neck in both soft and brilliant colors that seem to glow from within. They feel like nature’s jewels. 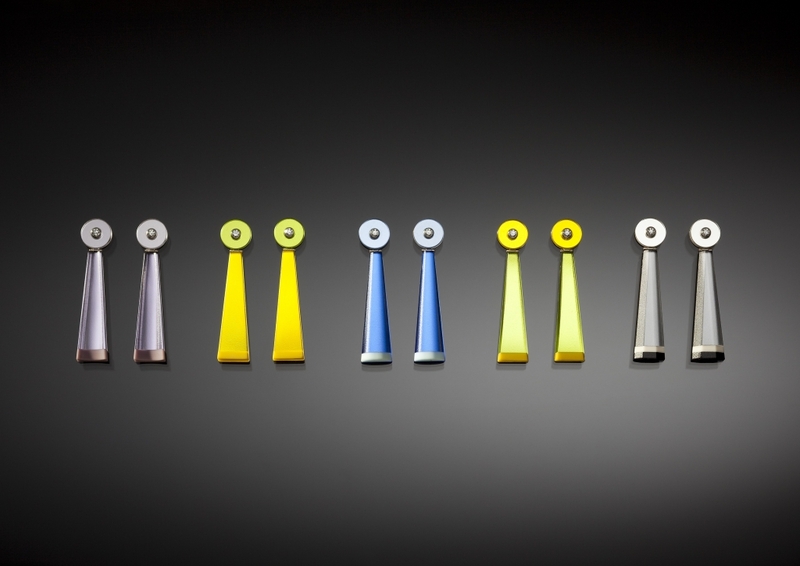 MacNeil’s latest series of Neck Collars is reminiscent of the exuberant, brightly colored designs of Memphis and the deliberate, minimalist grid paintings of Piet Mondrian. These are very bold pieces that are not for the shrinking violet. MacNeil’s powerful designs celebrate life itself, and they are a joy to wear. I have collected various types of glass in a broad palette of colors. Although the glass is intended for blowing, casting or optical lens making, I transform each to my own use because of its particular properties. Working with numerous machines, I cut and shape the glass and finish the surfaces off either by hand polishing to a high gloss or by satin acid polishing. The metal parts are created from sheet and bar stock that comes from industrial suppliers. I fabricate an original form which I intend to be cast in multiples for the connecting lines. Other forms are fabricated as a single piece which becomes a central element of the necklace. I work often in brass and silver which is plated with 24k gold. Some of my pieces are made directly in silver and gold. My first step in the process of creation is drawing, which leads to cutting and shaping the metal and glass. Although I follow the drawing, I often adjust the design in reaction to the development of the three dimensional forms. I have invented forms and processes over a period of twenty-five years that have become a personal vocabulary which I now rely upon. This allows me to compose neckpieces in a variety of ways. My interest in historic jewelry led me to approach the basic form of the neckpiece in a traditional manner. Two important characteristics of tradition are comfort to the wearer, and adornment of the body. For me the piece should complement the woman without overpowering her personal beauty.